White Wine May Be a Better Choice With Cheese Than Red : The Salt A new technique that examines the evolution of taste suggests that the strong flavor of red wine may dominate the taste of some cheeses, while white varieties may be more versatile and refreshing. Conventional wisdom would have you drink red wine with cheese. A new study, published in the Journal of Food Science, only partially supports that pairing, and also adds a new tool to the scientific study of food combinations. "Red wine with cheese, it can either go really well or not that well," says Mara Galmarini, a sensory scientist at CONICET, the Argentinian National Scientific and Technical Research Council. "A white wine, you have less risk." Ed Behr, editor of the influential Art of Eating newsletter, says he's not surprised. 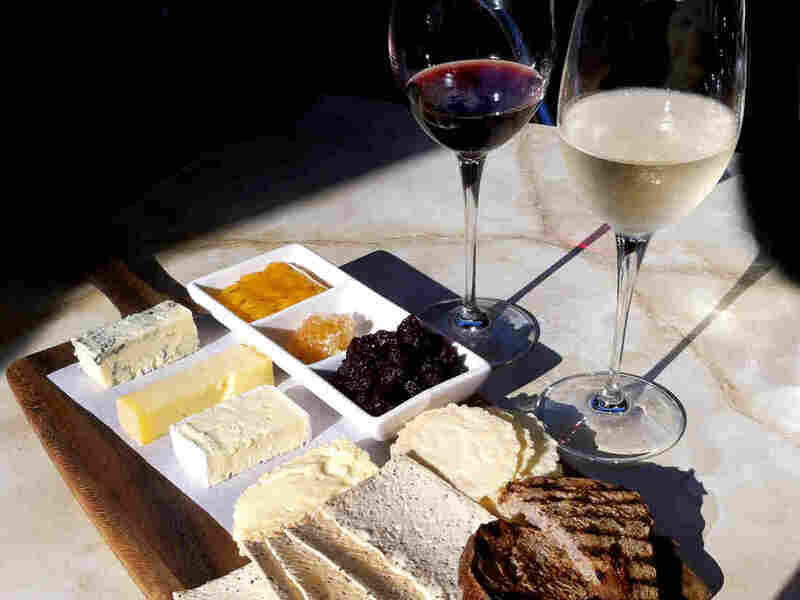 Behr has long argued that red wines and cheeses often fight, to the detriment of both. "There's no question in my mind that white wine goes better. And more often than not, depending on the cheese, a little sweetness makes things even easier," Behr told The Salt. Galmarini spent two years exploring wine and cheese pairings at the Centre des Sciences du Goût et de l'Alimentation (CGSA – Centre for Taste and Feeding Behavior) in Dijon, France. Much of the work was to build on a new technique called temporal dominance of sensations (TDS) that researchers there developed to examine how taste evolves over time. The problem with current methods, Galmarini says, is that they are static and singular. Expert tasters can accurately describe what is in their mouths, often giving a numerical rating to the intensity of each element of the flavor. That doesn't work to chart how the taste of a mouthful changes or how different foods and drinks affect one another. TDS is designed to reveal how the taste of something evolves as you consume it. The taster sits down in front of a computer screen with a black glass of an unknown wine. On the screen are 11 words describing attributes or sensations such as sour, astringent, bitter, floral and so on. During the experiment, the taster rates a black glass of unknown wine, describing attributes or sensations such as sour, astringent, bitter, floral and so on. Before the test, the tasters are given canonical examples of each sensation – such as a citric acid solution for "sour" and the scent of violets for "floral" – so that they understand exactly what each attribute means. The taster takes a sip and then clicks on whichever sensation is dominant at that moment. When the sensation changes — say, from "sour" to "red fruits" — the tester clicks the new attribute, until there is no sensation left. Then the testers rate how much they like the wine. That's a purely subjective judgment, with no attempt to define what "liking" means. They take another sip and do it all again. After a final sip, the test is over. While the TDS technique is relatively new, it is proving useful. Charles Spence, professor of experimental psychology at Oxford University and an expert on sensory evaluation, told The Salt that "it gives a finer degree of analysis." The temporal evolution of tasting experiences, Spence says, "has been kind of ignored previously, perhaps because it has been harder to get a dynamic sense of how perception is changing." TDS addresses that and, Spence says, is relatively easy. "That's part of its appeal," he said. For Galmarini, too, that is important. "Providing that the attributes are simple enough and well explained," she says "it can be used with consumers." For the experiment, 31 regular consumers of wine and cheese assessed four different wines: a sweet white Pacherenc, a dry white Sancerre, a full-bodied red Bourgogne and a rather tannic red Madiran. Then they did it again, between each sip of wine eating a small bit of cheese, four in all, so each wine was paired with each cheese. The cheeses were a chewy, firm cow's milk Epoisses, a semi-hard cow's milk Comté, a salty, blue-veined sheep's milk Roquefort and a crumbly, goat's milk Crottin de Chavignol. With so many combinations, the detailed results are complex. Nevertheless, Galmarini says there is a clear conclusion for certain sensations, such as sourness and astringency, which would probably be considered negative. "With cheese," she told The Salt, "the sensation is reduced. It does not last so long in the mouth." The reduction in negative sensations is mirrored by changes in likeability. Overall, tasters liked the wines more after the second and third sips with cheese than they did without cheese. The effect was most marked for the Madiran, which was also the wine that tasters liked least after the second and third sips. "I think that's because of an interaction with the fattiness of the cheese," Galmarini said. "It makes a coating in the mouth which reduces the astringency." Although the researchers did not set out to recommend specific pairings, The Salt pressed Dr. Galmarini. Her latest study, as yet unpublished, does offer some advice. "If you have many cheeses, better to serve a white wine," she says. Behr points out that most red wines "are completely unrefreshing." That's fine with a little cheese at the end of a structured meal, to finish the red wine. But Behr says, when the cheese is more than just a taste but "maybe the central protein of the meal, what you want is a drink that's much more refreshing." In other words: a dry white. Galmarini and her colleagues stress that the real value of their study is that it extends the new TDS method to study interactions with food. Spence sees the value in that. "Chefs are becoming more aware of the sequencing of sensations, rather than just combining flavors." The new method will help them understand why some of those sequences work and others don't. For Galmarini, wine and cheese is just a starting point. Whiskey and cigars, wine and chocolate, tea and pastries – all are now in her sights. "There are so many of these traditional pairings that have no sensory science background," she said. "Now we can study them with good data." Jeremy Cherfas is a biologist and science journalist based in Rome.